A nice little earner for a damp Tuesday in June! 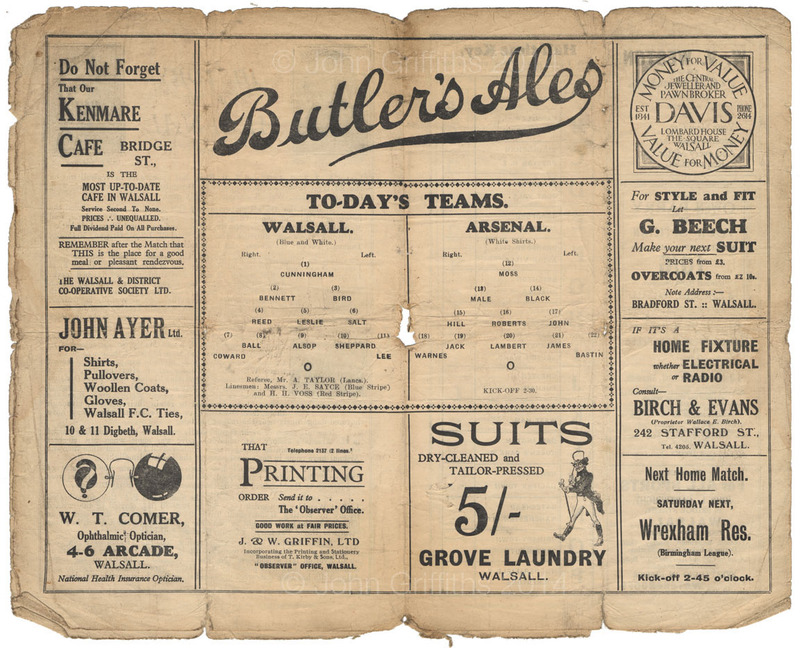 Page 3 of the tattered and torn Walsall v Arsenal programme from 1933. 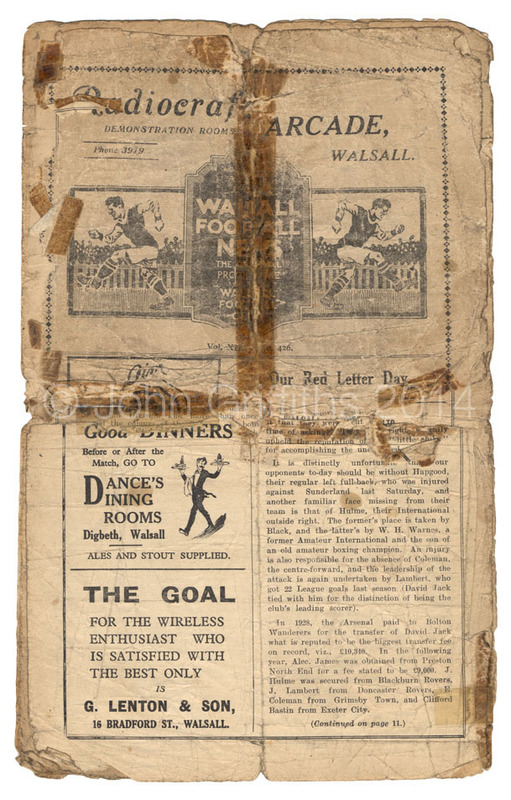 On the day a programme for the famous match between Walsall and Arsenal in January 1933 sells for £280 (all but a penny) on a well-known online auction site I rue the missing front and back covers from my copy! Whilst some people inherit family fortunes I am not quite so lucky….I cop for an oak tool chest of my granddads! One night in 1960 however its hidden treasure was revealed to me. The tool chest belonged to Billy Moseley, my granddad, who had died five years earlier. Since then the chest had stood in my dad’s shed in Sandwell Street unopened. For whatever reason dad carried the chest into the house and asked me to go through it and see what’s in it. My granddad had worked for the best part of forty years for the well-known Walsall company of Eyland & Sons Limited of Lower Rushall Street who made buckles amongst other things. The chest contained many buckle samples and prototypes and also the various tools used in the production of them but to an inquisitive thirteen year-old it revealed untold items that would be useful in making a variety of things that usually finished up by exploding or at least catching fire, or even better, both. After my rummage, and as boredom descended on me I began pushing all the draws back into place and found the bottom ones wouldn’t go back in. When I pulled the draws out again I discovered several sheets of yellowing, crumpled paper were causing an obstruction. Imagine my joy when I pulled the paper out and found it to be the Walsall versus Arsenal programme from 1933…..well almost! At the time I didn’t realise it should have had front and back covers, I thought I had struck gold, even if it had seen better days. For once in my life I couldn’t wait to get to the Chuckery Academy for Young Gentlemen (as I jokingly called Chuckery Senior Boys) to show off my “piece of gold” to the other lads, I even showed it to Mr. Higginson our history teacher. Not only did Higgo’, as we knew him, teach history, he also taught us the value of things and the object I had in my grubby little paws, due to its condition, wasn’t worth much at all. As he put it, “a bit like a jigsaw with all the corner pieces missing, never mind lad, you’ve got something few others have!” I drifted back to earth gently and realised another of life’s lesson had been learned today! In 1989 a limited edition reprint of the 1933 programme was produced, I have one of those too…..not quite the same though is it? The middle page spread showing the team line-ups. 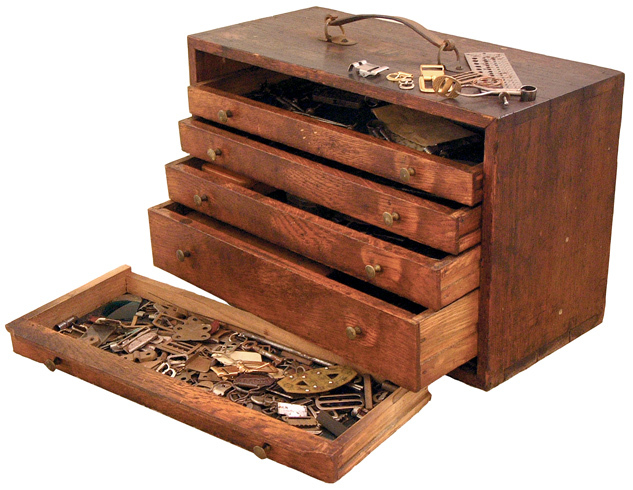 The toolchest the programme was found in. To anyone reading this blog, DO NOT, as I did 50 odd years ago attempt to repair any damaged and crumpled items you may have with Sellotape, all it does is make the problem worse. In time the adhesive dries out and the tape falls off leaving a residue that stains the item and cannot be removed. For help on the conservation of paper items ask the staff at your local history centre for advice…. and forget the Sellotape! You are currently reading A nice little earner for a damp Tuesday in June! at Walsall Life.